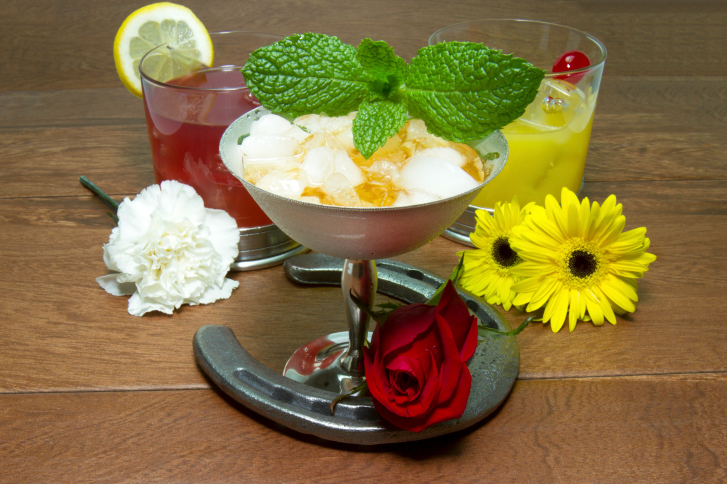 Celebrate your own Preakness Party with a delicious Black-Eyed Susan cocktail! On the third Saturday in May, the socialites don their finest wide-brim hats to celebrate the second leg of the Triple Crown. This group of horse races helps to determine who is the best of the best in the horse racing world. Will the victor of the Kentucky Derby go on to win the double or triple crown or will there be a new winner? This prestigious event is held at Pamlico Race Track in Baltimore. But for many of us, going to the track may not be feasible. So why not throw your own Preakness party in your very own apartment? Well, let’s check out some tips to throwing your own Preakness party! If you have not invited people over yet, it is time to get on the phone. Invite as many friends and neighbors as you’d like but make sure you have a firm headcount. Tell guests to dress in racing-style hats is possible or plan to have them make their own (we’ll get to that later.) Once you have a guest list, it is time to go shopping for food and drinks. While crabs are always a welcomed Maryland tradition, they aren’t necessarily the best for a large group of people crowded around your television. So instead, settle for crab cakes sliders. Mix a half cup of mayonnaise, one large beaten egg, one tablespoon Worcestershire sauce, half teaspoon of hot sauce, one pound of jumbo lump crab meat and 20 finely crushed saltine crackers. In a small bowl, whisk the mayonnaise with the mustard, egg, Worcestershire sauce, and hot sauce until smooth. In another bowl, toss the crabmeat with the crackers then fold in the wet ingredients. Scoop and form into silver dollar sized patties about one and a half inch thick then fry in a quarter cup of canola oil until deeply golden brown. Serve on buns or by themselves. For drinks, keep it classy with the traditional Black-Eyed Susan cocktail as well as wine, beer, and soda for non-drinking guests. For guests that don’t dress up, have construction paper, tape, and flowers ready for them to decorate their own derby hat. Decorate your apartment in the traditional black and golden yellow color scheme of the Preakness. Set out yellow and black plates, napkins, tablecloths, and crape paper to set the mood. What is a little Preakness party without a little better? Print out race forms for each guest and place bets before the race. All in good fun, of course. To have the best Preakness, invite some friends and family over to enjoy the race with you. Who said parties were only for the infield? Have a blast in the comfort of your own home and enjoy the races! Host a Preakness Party with Harborside Village Apartments! This entry was posted on Monday, May 16th, 2016	at 9:16 pm	. Both comments and pings are currently closed.